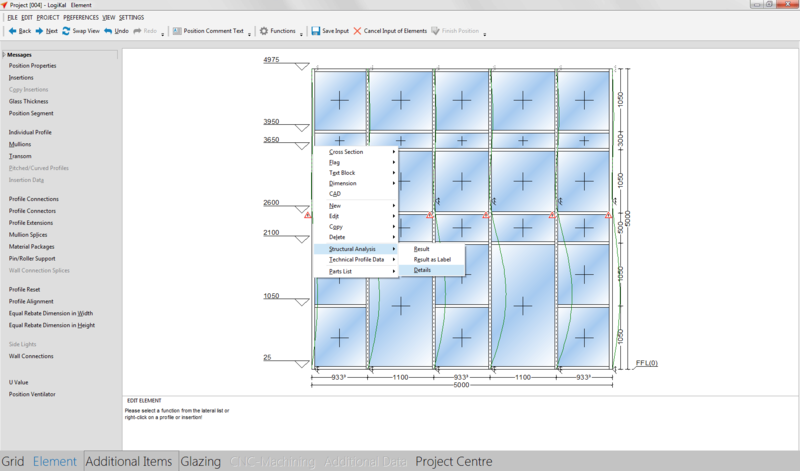 In order to perform a structural analysis of profiles and glass panes you must first define the actions and limit values of your current job in the job preferences form. Alternatively you may use the position selection form to do this. For this, click the button “Structural Analysis” at the bottom of your screen. 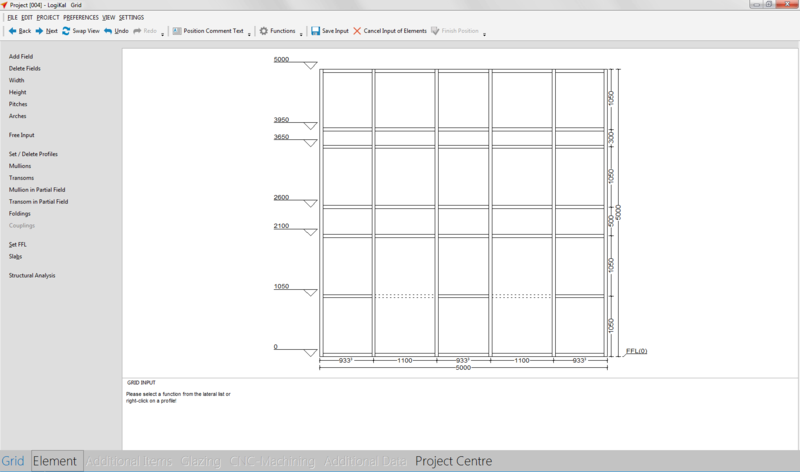 Then the “Structural Analysis Parameters” form will open. This form works exactly the same way as the one in the independent statics module. 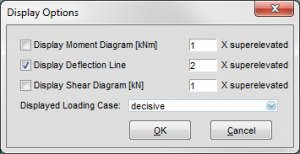 If you want to deactivate the structural analysis in your job again tick the checkbox “No Structural Analysis” and hit “OK”. As soon as you have determined the job’s structural analysis parameters the option “Perform Structural Analysis for this Position” is automatically ticked when you enter a new position. 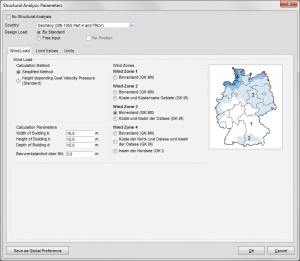 Specify the element’s position on the building which is required to calculate the wind loads. The button “Settings” can be used to alter actions and limit values of the whole job if necessary. 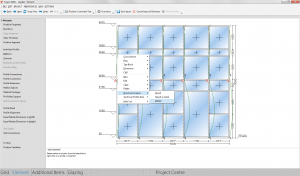 The program checks in the grid input form if the curtain wall position is located within the building dimensions. 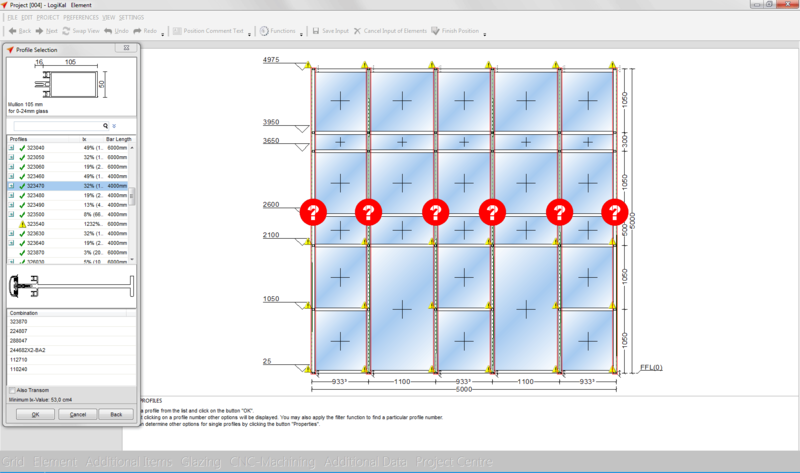 If not a warning appears and you can either alter the curtain wall dimensions or you can modify the element’s position on the building by clicking the button “Structural Analysis”. After having determined mullion and transom profiles you may set additional intermediate supports. For this click the button “Pin/Roller Support”. 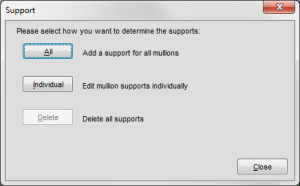 Bear in mind that the program places supports at the top and the bottom automatically. 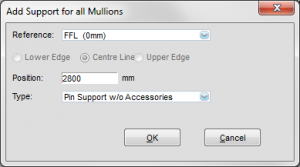 In this dialogue you are able to select whether you want to set supports on all mullions or only on individual ones. If supports are already set it is possible to delete those, too. Depending on which option you decide for one of the following forms appears. As soon as all supports have been set you are able to check in the profile selection function if the mullions fulfil the structural requirements under the current support conditions. 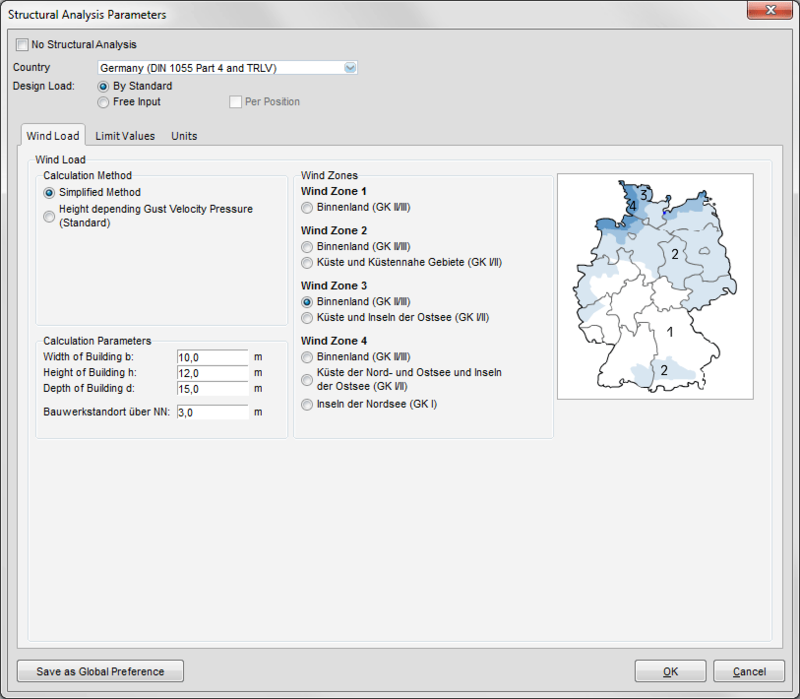 Only if Ix-values are assigned to profiles in the database (Economic-Data) LogiKal® states by a green tick or a red X whether the section is sufficient or not. The minimum required Ix-value is displayed in the bottom right corner of the screen. Transom profiles are always calculated as single-span-beams only. The deflection caused by dead load and glass weight (Iy-value) is not checked! 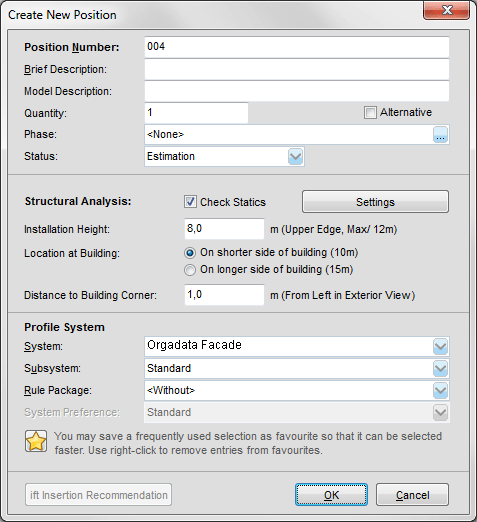 For this use the function “Beam Statics – Horizontal” in the independent statics module on the main menu. When the structural analysis function is activated you can display deflection lines, moment and shear diagrams by ticking the corresponding checkboxes. Therefor click on “View -> Static Diagrams”. 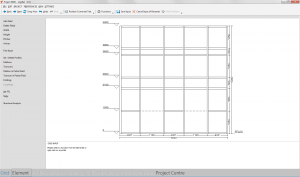 If you need a single mullion’s preliminary structural design results printed out during input of elements right-click the corresponding mullion and select the option “Structural Analysis” -> 2Details”. 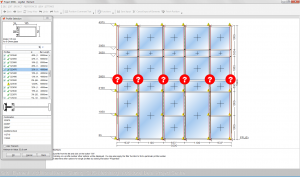 Door and window positions work in principle the same way as curtain wall positions. The only difference is that it is impossible to set additional intermediate supports there.